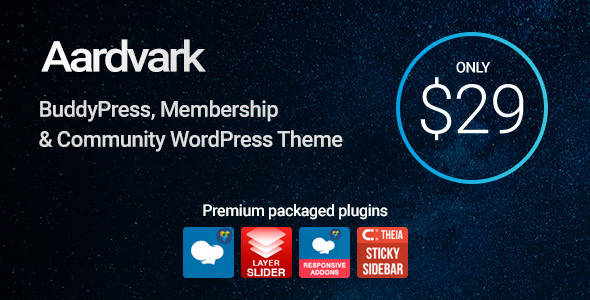 Aardvark is a complete community focussed WordPress theme. Buy with confidence from an elite author specialising in BuddyPress themes. Who Is This Theme For? Anyone and everyone really! Seriously, itâ€™s a full multi-purpose theme. But specifically if you want to create a community, charge for membership access and sell online courses this theme is perfect for you. 200+ theme options to easily create a great looking site to meet your specific needs without ever touching a piece of code. These plugins are bundled with the theme. for more information on bundled plugins please click here. These plugins are not bundled with the theme and need to be purchased separately. These plugins have been specifically designed to work with the theme and are completely free, as a result they are not bundled with the theme, but the theme can automatically install and set them up for you. This theme comes with an extensive help file that explains how to set up every aspect of the theme. If you still have any questions visit our support site where we respond to all questions within 24 hours Monday to Friday.